In stock -This product will ship today if ordered within the next 12 hours and 36 minutes. Rich and distinctive, Sweet Freedom Dark Fruit Syrup perks up porridge & pancakes and turns everyday food into clever treats. At Sweet Freedom they make healthy taste great! Sweet Freedom believes that what they leave out is just as important as what’s added in. There will never be any additives, preservatives, or chemical processes with any of the Sweet Freedom range. Always sweet, but always natural. Syrup made from natural fruit extracts: apples, grapes & carob. Squeeze, drizzle, spread - Sweeten your porridge, pancakes, toast, yoghurt and cooking. 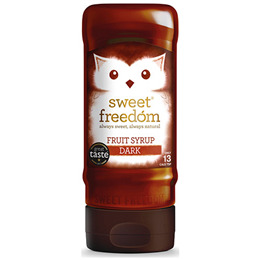 Below are reviews of Sweet Freedom Fruit Syrup - Dark - 350g by bodykind customers. If you have tried this product we'd love to hear what you think so please leave a review. Can’t get this in my local supermarkets so searched online. Fabulous as a desert topper and fantastic on pancakes and freshly made waffles. Great desert topping which is low in calories.